This article is about the line formation in fleet. For the line of battle in infantry and cavalry, see Line (formation). A French squadron forming the line of battle circa 1840. Drawing by Antoine Morel-Fatio. In naval warfare, the line of battle is a tactic in which the ships of the fleet form a line end to end. Its first use is disputed, but variously claimed for dates ranging from 1502 to 1652, with line-of-battle tactics being in wide use by 1675. The line of battle has the advantage over previous naval tactics—in which ships closed on each other for individual combat—that each ship in the line can fire its broadside without fear of hitting a friendly ship. Therefore in any given amount of time more shots can be fired by the entire fleet. Another advantage is that a relative movement of the line in relation to some part of the enemy fleet allows for a systematic concentration of fire on that part. To fend off this possibility the other fleet too can move in a line, with the result so typical for sea battle since 1675: two fleets sailing along each other or in opposite tack. A ship powerful enough to stand in the line of battle came to be known as a "ship of the line" (of battle) or a "line of battle" ship which shortened to become "battleship". A contemporary depiction of the battle of Öland between an allied Danish-Dutch fleet under Cornelis Tromp and the Swedish navy. The Swedish ships are arranged in a battle line in the early stages, but they quickly become disorganized and suffer a humiliating defeat. Copper engraving by Romeyn de Hooghe, 1676. A primitive form of the line of battle tactic had been used by the Portuguese under Vasco Da Gama in 1502 near Malabar against a Muslim fleet. One of the earliest recorded deliberate use is documented in the First Battle of Cannanore between the Third Portuguese Armada under João da Nova and the naval forces of Calicut in the same year. While it is well documented that Maarten Tromp first used it in the Action of 18 September 1639, some have disputed this. The first written instructions in any language adopting the formation were contained in the English Navy's Fighting Instructions, written by Admiral Robert Blake and published in 1653. Individual captains on both sides of the First Anglo-Dutch War appear to have experimented with the technique in 1652, possibly including Blake at the Battle of Goodwin Sands. From the mid-16th century the cannon gradually became the most important weapon in naval warfare, replacing boarding actions as the decisive factor in combat. At the same time, the natural tendency in the design of galleons was for longer ships with lower castles, which meant faster, more stable vessels. These newer warships could mount more cannons along the sides of their decks, concentrating their firepower along their broadside. Until the mid-17th century, the tactics of a fleet were often to "charge" the enemy, firing bow chaser cannon, which did not deploy the broadside to its best effect. These new vessels required new tactics, and "since ... almost all the artillery is found upon the sides of a ship of war, hence it is the beam that must necessarily and always be turned toward the enemy. On the other hand, it is necessary that the sight of the latter must never be interrupted by a friendly ship. Only one formation allows the ships of the same fleet to satisfy fully these conditions. That formation is the line ahead [column]. This line, therefore, is imposed as the only order of battle, and consequently as the basis of all fleet tactics." The line of battle-tactic favored very large ships that could sail steadily and maintain their place in the line in the face of heavy fire. The change toward the line of battle also depended on an increased disciplining of society and the demands of powerful centralized government to keep permanent fleets led by a corps of professional officers. These officers were better able to manage and communicate between the ships they commanded than the merchant crews that often comprised large parts of a navy's force. The new type of warfare that developed during the early modern period was marked by a successively stricter organization. Battle formations became standardized, based on mathematically calculated ideal models. The increased power of states at the expense of individual landowners lead to increasingly larger armies and navies. The line is at its most effective when moving perpendicular to the axis of movement of the enemy fleet, e.g. by "crossing the T" or by breaking the enemy line and moving through it (e.g. Four Days Battle, Battle of Schooneveld, Battle of Trafalgar), by trying to cut off and isolate part of the enemy's line and concentrating a stronger force on it (e.g. Battle of Texel, Battle of the Saintes), or by trying to "double up" the enemy's ships (e.g. Battle of Beachy Head). This way the enemy ships block each other's line of fire. The main problem with the line of battle was that when the fleets are of similar size, naval actions using it were generally indecisive. The line was also easily countered by the gunnery doctrine where material damage at long range is the goal. The French in particular were adept at gunnery and would generally take the leeward position to enable their fleet to retire downwind while continuing to fire chain shot at long range to bring down masts. 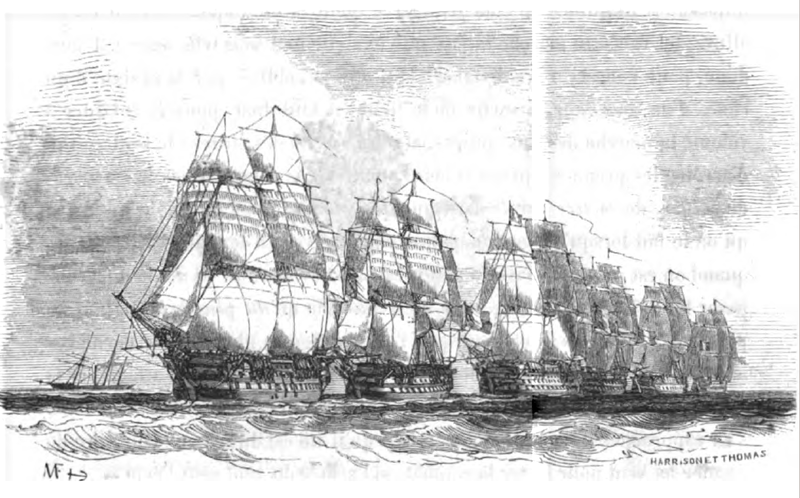 Eventually so many vessels in a line would be damaged that they would be forced to retire for repairs while the French took few casualties and very little damage themselves. British Permanent Fighting Instructions were so inflexible in regards to the use of the line that a British fleet had never won a single tactical victory against a fleet of comparable strength in the century before the Battle of the Saintes in 1782 when Admiral George Rodney disobeyed the Instructions to win decisively. For a period in the late 19th century, naval tactics became chaotic as ironclad warships were introduced. One school of thought held that ironclads were effectively invulnerable to gunfire, so ramming became a popular method of attack, for instance at the Battle of Lissa or the Battle of the Yalu River. Another held that naval battles would only be decided by an assault on an enemy fleet in port. Ships built according to these doctrines tended to mount a handful of guns which could fire ahead or all-round, rather than broadside. The fleets of these periods tended to use the line of battle less. However, as ramming fell out of fashion, the logic of the line of battle returned; used in the Battle of Tsushima of 1905, the Battle of Jutland in 1916 and finally in the Battle of Surigao Strait in 1944. During World War II the development of aircraft carriers meant that gun engagements were no longer decisive. This meant there was no rationale for using a line-of-battle formation. In modern naval warfare, a battlegroup generally deploys with the highest-value units in the centre, accompanied closely by anti-aircraft escorts, with a number of anti-submarine escorts surrounding the formation at a distance of tens of miles. Some military science fiction works, such as the Honor Harrington novels, revive the term "battle-line", or its 3D analogue, "wall of battle", to refer to the formation of heavy warships of a space fleet. ↑ If the fleet is in front of the flagship it is a line ahead, if behind a line astern. ↑ 6.0 6.1 6.2 Fighting Instructions, 1530-1816 Sir Julian Stafford Corbett, Publications Of The Navy Records Society Vol. XXIX. ↑ Glete (1993), p. 176. ↑ Koenig, William (1975). Epic Sea Battles. Page 11-12: Peerage Books. ISBN 0-907408-43-5. Corbett, Julian S. (Julian Stafford), 1854–1922 Fighting Instructions, 1530–1816 Publications Of The Navy Records Society Vol. XXIX. Rodger, Nicholas A. M., "The Development of Broadside Gunnery, 1450-1650." Mariner's Mirror 82, No. 3 (1996), pp. 301–24.